These multipurpose, modern style planters, are a perfect complement to your interior or exterior décor. Choose between various colors and sizes to pair with your favorite plants in your living space. Each are equipped with built-in trays to protect decks, patios, and indoor surfaces from water damage. These lightweight, sturdy plastic pots are built to last for years and years. 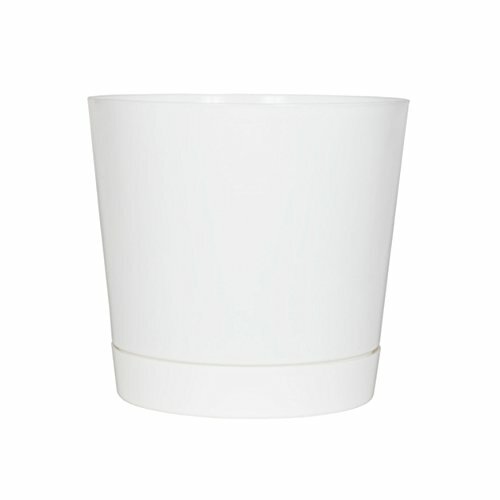 The sleek, contemporary line of Full Depth Cylinder Pots are recyclable and proudly made in the USA. Size Dims. (⌀" x H") 6-Inch: 6.25" x 5.8" 8-Inch: 8.25" x 7.8" 10-Inch: 10.25" x 9.8" 12-Inch: 12.3" x 11.8" 14-Inch: 14.25" x 13.8" For best results and to promote healthy plants in a Full Depth Cylinder Pot: • When planting, create a drainage layer on the bottom of the pot by adding a medium such as pebbles, pumice or clay pieces. The drainage layer should be about 2-3 inches. To prevent overwatering when using outdoors, expose the bottom drainage holes by removing the snap-on tray. • Add potting mix and fill the container up to 1" from the top. • Add or transplant your favorite plant to the pot. • Position the planter in an area that will allow the plant to receive the recommended amount of sunlight. • After initial planting, refer to the after-care instructions for each specific plant species. • Water accordingly. If you have any questions about this product by Novelty, contact us by completing and submitting the form below. If you are looking for a specif part number, please include it with your message.